It is time to think Spring, a little winter blues. Start planning the garden now. Drawing a map of your future garden is possibly the most fun part of garden planning! When you are looking at 18" plus of snow covering your garden the soil outside is cold and frozen, dreaming about how your garden will look in just a few months is incredibly satisfying. In the middle of winter and draw out a lovely garden layout map to use in the spring. Planning your garden is a wonderful way to beat the winter blues. 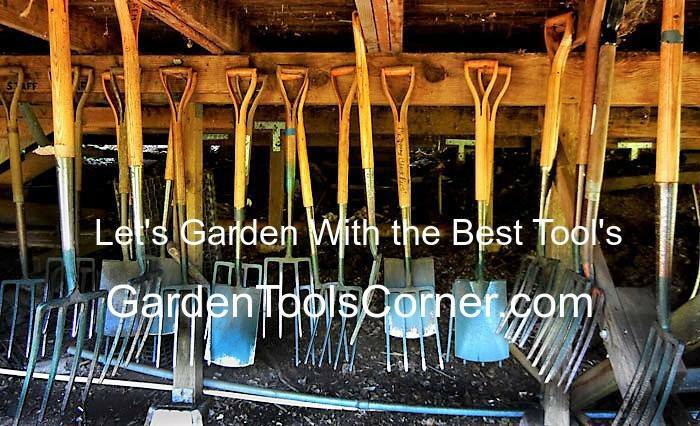 Proper planning will also make your garden planting so much easier once it does warm up outside. Just follow the garden layout you’ve created for yourself and you’ll find that the process of planting your garden outdoors is easy and fun if you’ve got a proper plan. Before you know what you want, you need to figure out what you have. Start by drawing a map of your yard with existing trees, shrubs, slopes, patios and whatever else is out there. The map can be as formal (a scale version of graph paper) or casual as your need for detail dictates, but the more accurate it is, the more thorough your garden plan will be. Make note of the factors noted above that influence the kind of plantings that will follow. Locate areas with full sun and partial shade. Indicate places that are sheltered from the wind and where the best soil is. You should only have to do this ounce and create a template. Go outside and measure your available garden space. If you don’t yet have a garden, now is a great time to plan the sizing details out. You’ll already have estimated your total available area in the garden planner, so use that as a guide. While you’re outside, take note of environmental factors such as common wind directions, shadows from other structures, the locations of large trees, and which areas get the most sun. These factors will affect where you place your plants. I like to use graph paper 1/4 inch equals 1 foot. 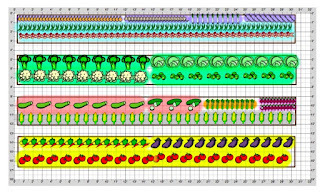 Your garden planner includes a layout mapping page. Get your planner out, along with some stationary. I usually use a ruler, pencil, thin black sharpie, and pencil crayons for the garden mapping process. 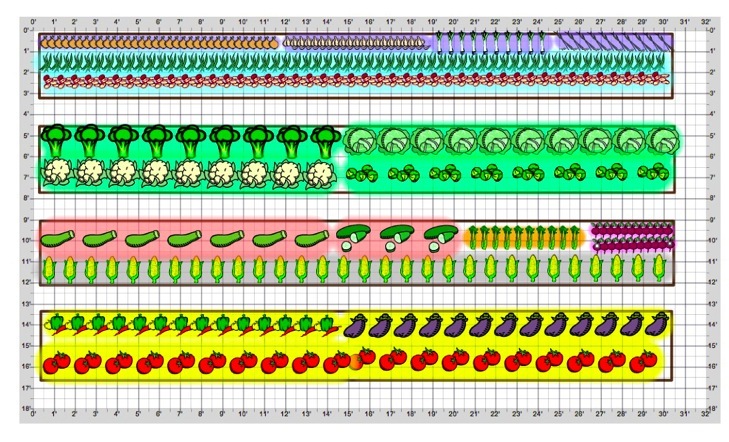 Mapping out your garden begins with setting a proper scale. Since I generally follow the Square-Foot for each plant Gardening Method, I like to draw out my garden layout so that each box on my garden map represents one square foot of real garden soil. It doesn’t matter what scale you set, it just matters that you use it consistently as you make your map. You’ll have to have the real outdoor dimensions of your garden to complete this step. Once the garden is planned, and the vegetables are chosen it was time to thumb through the seed packets and growing guides to see just how much time they all need to grow, deducing which ones should be started indoors. I will be starting onions, tomatoes, eggplant, peppers, cucumbers, squash, and pickles, possibly a few more. So far I have only started onions and garlic since they require a very long growing season. We will see if it works. As the winter winds down I will start more seeds, again taking note of how long each plant requires. This is another good reason to map out your garden. I never plant the same plants in the same place twice. Put simply, crop rotation is a systematic method of deciding what to plant where in your vegetable garden from one year to the next, based on plant groups. Moving plants to new locations each year. It improves your garden in two major ways. First, it helps keep your soil healthy and fertile. Planting the same thing in the same place year after year drains the nutrients from the soil that the plant needs in order to thrive and produce big harvests. Second, rotating plant families helps manage soil-borne diseases like verticillium wilt, and soil-dwelling insects like corn rootworms. These types of diseases and pests prefer certain kinds of plants, and the longer the plants stay in the same soil, the better the chance that these enemies will show up and cause trouble. Water sources are another important detail to add to the map. I like to keep the water source in the middle of the garden or gardens in my case. With underground sprinklers or simply a spigot. Keep the source centrally located. Our garden has a slight hump in the middle for good drainage, the water runs to the ends of the rows. Elevations are also important. Does the land slope towards its borders or rise in the center? Generally, you’ll want drainage to move away from your home, not toward it.